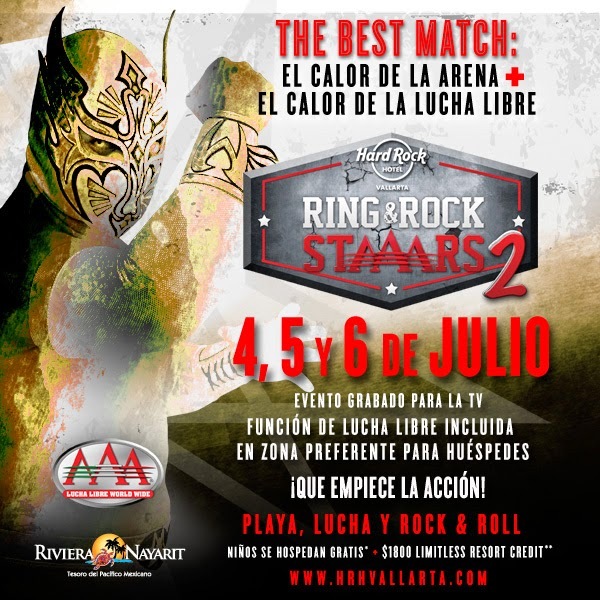 The Hard Rock Hotel will host Ring & Rock StAAArs 2 this July 5th; the event will be taped by Televisa and transmitted via open channels around Mexico. Headliners include Cibernético and Mystezis vs Chessman and Averno. Professional wrestling takes the stage this weekend at the Hard Rock Hotel in Nuevo Vallarta with the presentation of Ring & Rock StAAArs 2, an all-out spectacular event that matches the heat of Mexico’s Pacific Treasure with the heat of the wrestling ring. For the second time since December the Riviera Nayarit welcomes Triple A wrestlers for beach time, wrestling and rock n’ roll, this time on July 5th. Mexico’s Televisa will be transmitting the match to millions of fans throughout the country. The headliners are Cibernético and Myzteziz, who will be challenged by Chessman and Averno. Other participants include Los Psycho Circus, Texano Jr., El HIjo del Fantasma, Silver King and many more. “There’s a lot of radio and print promotion going on now in Guadalajara and the Bajío to boost hotel room sales. We’re offering guests a red carpet rollout and the chance to mingle with the wrestlers on Friday, July 4th at 8 p.m.,” said Héctor Belman, Director of Marketing and Meetings for the Hard Rock Hotel. “Saturday, July 5th, will be chock full of activities with the wrestlers at the pool doing water aerobics, there will be a BBQ, a billiard tournament and a wrestling workshop. The minis will be at the Kids Club. We’ll also offer guests preferred access to the event,” he added. The wrestling match is open to the general public. Tickets are on sale now through www.ticketmaster.com.mx priced from $120 to $500 Mexican pesos. Besides the ongoing promotions, this kind of event also receives collateral publicity thanks to the sports media that follows these matches both on a domestic and international level. The Riviera Nayarit Convention and Visitors Bureau warmly congratulates the Hard Rock Hotel for its constant stream of events that serve to promote the destination and especially for its promotion of Mexican wrestling, demonstrating the destination’s versatility for hosting a wide gamut of events.